Join us for a Summer full of tennis and fun! Contardi Tennis Camp – A Cincinnati Tradition for 45 years! Forty-four years ago we brought the idea of an all day tennis camp to Cincinnati. Today, thanks to an enthusiastic tennis community, the Contardi Tennis Camp has become a Cincinnati tradition as well as one of the most recognized tennis programs in the United States. Our tennis camp formula combines a dedicated and qualified staff with a great facility and a “Tennis is Fun” attitude. For over 40 years this formula has helped youngsters of all ages develop the skills to enjoy the lifelong benefits of tennis. Please click here to download the 2019 Contardi Tennis Camp brochure and see details below. 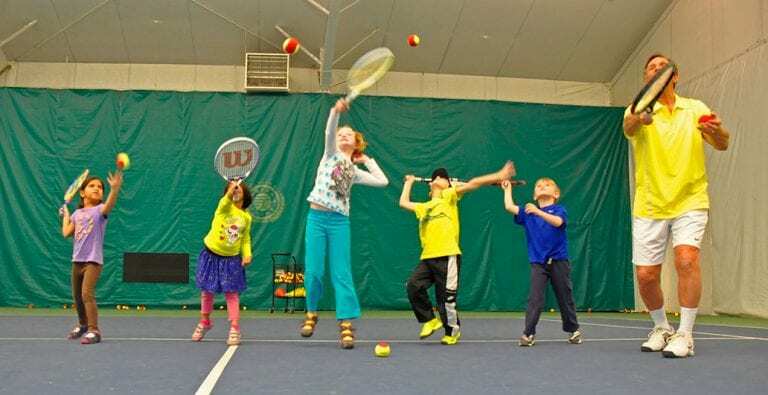 Join us for the 2019 Contardi Tennis Camp! Contardi Tennis Camp offers a concentrated, but highly interesting and invigorating tennis experience – an intense and rewarding learning-and-playing-program of self-improvement. Instruction is geared to all levels of play – from beginner to tournament player. Every aspect of the tennis game is thoroughly covered, including: basic strokes, strategy and overall conditioning. Drills will be designed to provide game-like practice for every possible playing situation. Knowing the need for personal attention in instruction, we will maintain a low student-teacher ratio throughout the sessions. In addition, our indoor courts are fully air-conditioned. Interested in Summer Junior Clinics? Click here to view the 2019 Summer Junior Clinic schedule.